This box only requires 10-12 psi to push beer, perfect for people who will leave beer tapped up for the weekend (like home brewers). The lower pressure means you do not have to run 30-40 PSI which will quickly over carbonate beer if left hooked up for too long. High quality beverage tubing included. Lines retract back into the box for easy mobility. Use ice water around coil. Quick disconnects for connecting to the keg are not included. 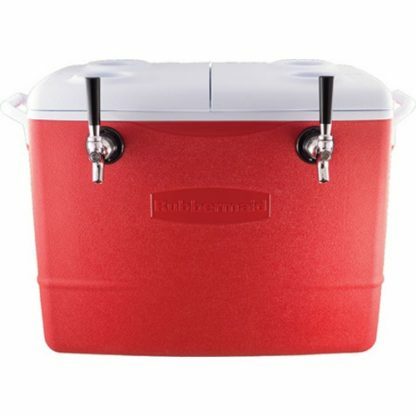 With the Draft Jockey Box your beer will pour cold for hours! Take it camping, tailgating, or just pull it out when the gang is over. 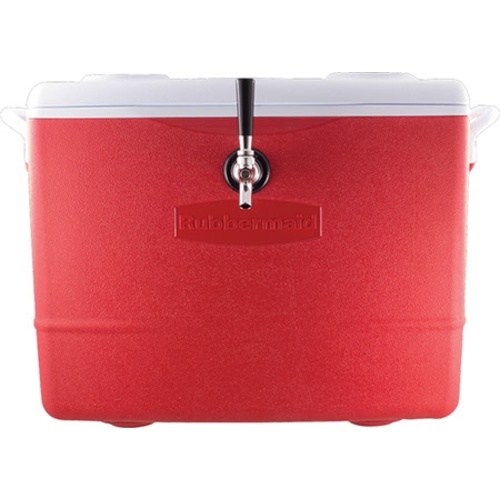 Draft Jockey Box includes a Rubbermaid insulated cooler, a 50′ x 3/8″ stainless steel coil, faucet, shank and beer line clamps. 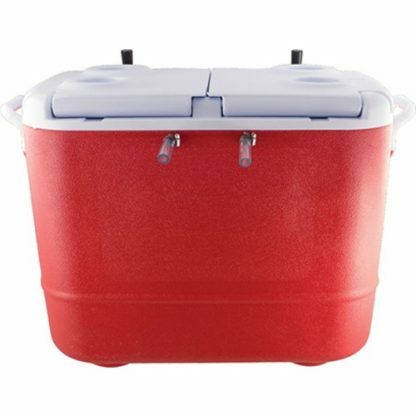 1) It cools a greater volume of beer, and cools it faster. The coil will hold approximately 33 oz of beer at a time. 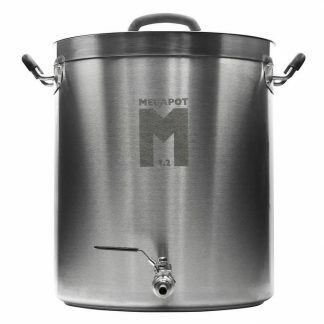 2) The larger diameter line offers less resistance, which lets you push the beer with less CO2 pressure. 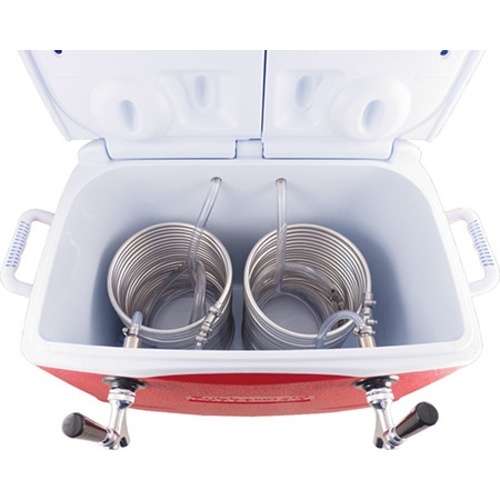 Our boxes require about 10-15 psi from the CO2 tank to push the beer from the keg to the faucet (same pressure you use to dispense at home). 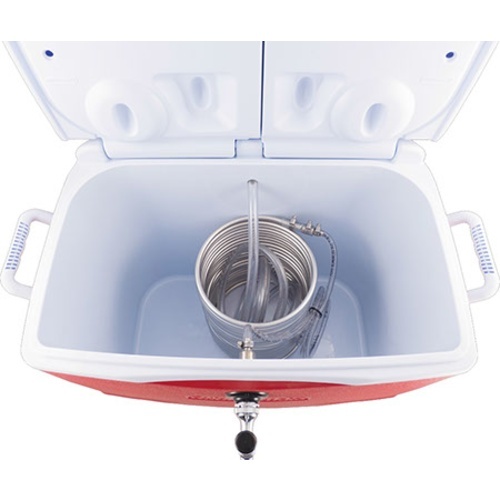 Because the vast majority of beer lovers opt to keep their beer cool at all times to protect flavor (especially a homebrewer who is going to retap the same kegs at home!) and reduce foaming issues, most people opt to also ice the keg. The low applied pressure of 10-15 psi means that if you leave the system hooked up overnight, the beer will not over carbonate. If you do not plan on keeping the keg cold, which is perfectly fine, our system still works great because you can disconnect the line (if left for days) to keep the beer from losing carbonation. We do not use shanks on the back side of our boxes. 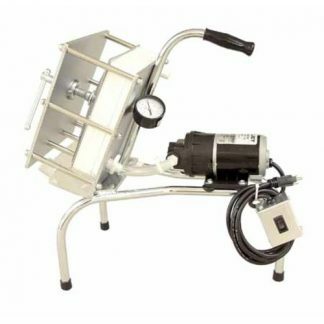 We drill holes slightly smaller than the line size so that a tight seal is created but you can still pull the line in when not in use, without having a wrench on hand. 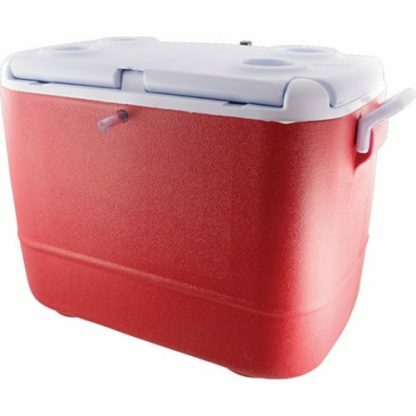 This makes storage and transport extremely easy. You will appreciate not having lines flopping everywhere. You will need to purchase the appropriate tap for your needs, be it commercial or homebrew quick disconnects. You will also need a CO2 system, comprised of a CO2 tank and regulator. It is much more likely for a beer left at a high psi to overcarbonate (become foamy) than a beer left at a low psi to lose carbonation. 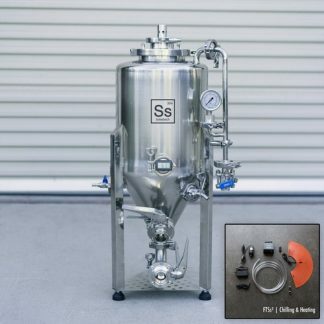 The reason is that gas will always keep coming from the regulator until the gas/beer pressure have reached an equilibrium, so over time the high psi setting becomes the pressure in the beer. However, for a beer to lose carbonation it has to come out of solution into the headspace in the keg. Because the headspace is limited, only so much CO2 can come out, and the keg pressure will not drop all the way down to the lower regulator pressure on its own. This is the reason that if you have overcarbonated a beer you have to repeatedly vent the keg, reducing the pressure in the headspace to 0, and allowing more gas to escape from the beer. For the best performance when using a draft box, tests have shown that ice water is actually the most effective at cooling the coils. So, as the ice melts, DO NOT OPEN THE VALVE ON THE COOLER. Draft boxes with Cooling Plates (stainless coil embedded in aluminum) are designed to work with the valve open, ours is not.